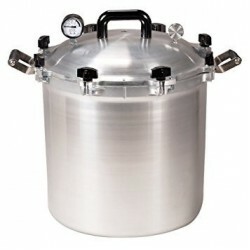 CAN I DO A TRIAL RUN WITH ONLY WATER IN MY PRESSURE COOKER/CANNER TO BECOME FAMILIAR WITH THE OPERATION OF THE PRESSURE COOKER/CANNER? Yes, if you are unfamiliar with our pressure cooker, or have never canned before, it is a good idea to familiarize yourself with a trial run before processing any canned goods. CAN ALL-AMERICAN PRESSURE COOKER/CANNERS BE USED ON GLASS-TOP STOVES? No, it is our understanding that the manufacturers of glass-top stoves recommend using only flat cookware, and the ALL-AMERICAN Pressure Cookers have indentations in the bottom. Also, the cooker is quite heavy and if dropped or slid across the glass-top stove, it may damage the cook top. You may want to check with the manufacturer of your range for additional information.Xscyth3 Was Here! 4) WHY CAN’T I REMOVE MY COVER AFTER CANNING? A.) Apply a thin film of lubricant (extra virgin olive oil or Vaseline) to the metal-to-metal seal (to the edge inside the cooker where the inside wall begins to bevel out). You only need enough lubricant to wet the edge, but not enough to actually see it. B.) Also lubricate the threads of the No. 64 Wing Nuts and the metal face around the threads of the wing nuts. C.) Tighten two opposite wing nuts at a time; making sure that there is an even gap all the way around. If you have a problem maintaining the gap, while wing nuts are snug, tighten as follows: If one side is too low, loosen the low side and then tighten the high side directly opposite until it is even, and then tighten both at the same time. Continue to do this with all opposite wing nuts, and then go around one more time to tighten the cover down securely. Do not be afraid to tighten the cover down good and tight. D.) Check the lubrication between canning batches. E.) You may also clean the metal-to-metal seal. After wiping the old lubricant off with a soft cloth, use .0000 steel wool, a red 3M Scotch Brite Pad, or an SOS Pad to buff in a circular motion where the cover and bottom meet. Wipe down the sealing surface again using a soft cloth and be sure to lubricate the metal-to-metal seal after cleaning. F.) If your cover is stuck, there are directions in the instruction manual for removing a stuck cover: Using a large standard screwdriver, pry the cover loose by placing the end of the screwdriver at an angle between the cover and bottom near a wing nut assembly. Do not go straight in with the screwdriver or you will damage the metal-to-metal seal. Gently pry upward using the screwdriver as a lever. Continue to pry upward at each wing nut assembly area uniformly so that the cover is raised evenly. In most cases, the cover should come off rather quickly. 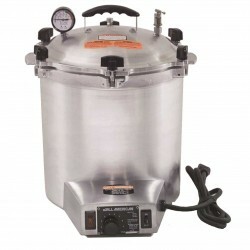 WHAT IS THE ADVANTAGE OF THE MODEL 925 OVER MODEL 921 PRESSURE COOKERS? Both cooker/canners hold the same number of jars; the only advantage is when cooking, Model 925 holds 3-1/2 quarts more in liquid capacity. WHERE CAN I HAVE MY STEAM GAUGE TESTED? Some home economists at local county extension agencies still test steam gauges. We do not test gauges as it is more expensive to ship a gauge to us, pay the labor to have it tested, and pay the return shipping charges than to purchase a new steam gauge. IS IT NECESSARY TO HAVE MY GAUGE TESTED WHEN USING THE PRESSURE REGULATOR WEIGHT? No, the pressure regulator weight is actually more accurate than the steam gauge. Many pressure cookers with pressure regulator weights do not have steam gauges. Our gauge is accurate +/- 2 lbs, and is used only as a reference, and to determine when the cover can be safely removed, which is when the steam gauge returns to zero. I CANNOT REMOVE MY STEAM GAUGE / VENT PIPE / TOP HANDLE FROM MY COVER. You can try putting WD40 or penetrating oil on the threads and letting it set overnight; you should then be able to remove the part easily. MY PRESSURE COOKER IS DISCOLORED ON THE INSIDE. This is most likely due to mineral deposits in your water, and may be permanent but not harmful. You can try cleaning with a boiling solution of one tablespoonful of vinegar or two tablespoons of cream of tartar in a quart of water, or by scrubbing with aluminum cleaner or soap impregnated steel-wool cleaning pad. WHY DOESN’T MY # 68 PRESSURE REGULATOR WEIGHT RELEASE? Steam may be releasing/escaping from underneath the weight and not jiggling, however, you are most likely at the proper pressure. You may try tapping the weight gently with a knife. WHY DOES MY # 68 PRESSURE REGULATOR WEIGHT CONSTANTLY RELEASE? Most likely your heat setting is too high. Lower your heat setting so the weight releases approximately four times per minute. which save's on gas,the instruction book is easy to understand,and has some great recipes.I would recomend buying the Ball Blue Book Guide to perseving to go with this canner. I'm very happy i bought this canner.Thanks Ozfarmer. Bottle Almost Anything! NO GASKETS! Bottle meats, fish, vegetables and fruits with the famous All-American pressure preserver! Only All-American Pressure Cookers/Canner feature an exclusive, precision machined "metal-to metal" sealing system. Positive action clamping locks align the cover to the base, forming a steam-tight seal. At the same time, this metal-to-metal seal automatically permits venting under unusual pressure conditions, providing an extra margin of safety over conventional rubber or composition gasket cookers. The All-American Presure Cooker/Canner is, first and foremost, a canner. It is large and heavy-cast for processing larger quantities of food per load. *Jar capacities are based on standard Mason jar sizes. All-American Pressure Cooker/Canners are intended and manufactured solely for home use applications.canners cannot be used on turkey burners: these are specialised gas stoves with very high butane ratings. Standard gas burners available in Australia do not meet these sorts of heat but the burner must have an adjustable flame to prevent damage to the canner). They are not intended for commercial applications. All American canners carry a 1 year limited manufacturer's warranty. It is VERY IMPORTANT that you read and follow the instructions for use. 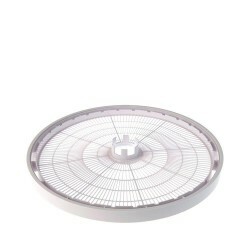 This quality appliance is designed and manufactured to provide many years of satisfactory performance under normal use. Wisconsin Aluminum Foundry pledges to the original owner that should there be any defects in material or workmanship during the first year after purchase, we will repair or replace it at our option. This pledge does not apply to damage caused by shipping. We want you to obtain maximum enjoyment from using this quality pressure cooker and ask that you take the time to read and follow the instructions enclosed with the pressure cooker. Ball Mason Deluxe Preserving Kit for Stove Top UseGreat for beginners and people on solar, this ..
Pressure Canner All American 10.5 Quart (10 litre)You will love this it's "So Cute!!" great for ..
What a great present for the smallish canner: it's "So Cute!!" great for Bottling meats, fish, veg..
Pressure Canner 41.5 Quart (39 Litre) All American This IS the ultimate in food preserving! 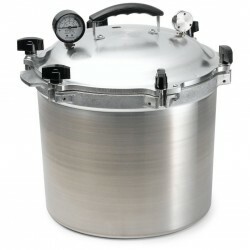 Grea..
Pressure Canner / Cooker All American 25 Quart (23.5 Litre)Bottle meats, fish, vegetables and..
Includes 6 Green Heritage Quart JarsNote: picture shows the standard 15psi regulator but the O..
Electric Steriliser / Autoclave All American 25 Quart (24 Litre) 50X-240VWisconsin Aluminum..
Over 10,000 years of cheese making (plus butter and yogurt making) wisdom is contained in this bulle..
Charcuterie The Craft of Salting Smoking and Curing by Michael Ruhlman and Biran PolcynCharcuter..